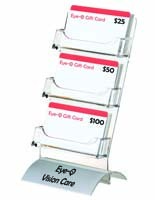 These Gift Card Displays Provide a Great Way to Capture the Attention of Shoppers! Design a Store-Specific Advertisement for the Holders! 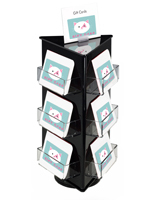 These Gift Card Displays Will Definitely Increase Sales! These gift card displays are exceptionally useful tools for today's market, especially because these types of promotional certificates are so popular. The convenient countertop assembly of the holders is great for placement near checkouts and registers. 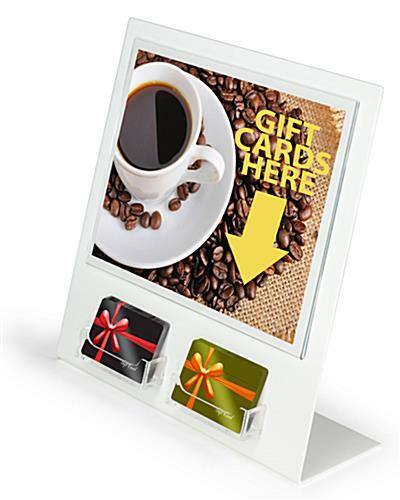 This way, the gift card displays will capture the attention of customers while they wait for service and prompt them to buy a few last minute items. One of the most interest features of the fixtures is that they come with a sign insert slot for a custom graphic. The gift card displays will fit a 11" wide x 8-1/2" tall print. The holders are so easy to use! 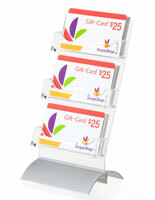 Many users customize the gift card displays by simply printing out their own information with a personal computer. Then, the media is slid right in through the top for a quick signage solution. The pockets on the gift card displays are able to fit cards that are not pre-packaged. Lots of marketers and store managers prefer to show the actual cards themselves because they often feature very decorative and enticing designs. The clear acrylic design of the gift card displays keeps the artwork of the cards front and center at all times.